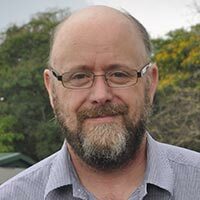 Michael Abberton is Head of the Genetic Resources Center, IITA, Ibadan, since August 2012. He obtained his B.Sc. in Botany and Ph.D. in plant cytogenetics from the University of Manchester and subsequently undertook postdoctoral research in molecular biology at the University of St. Andrews. Following two years working on coffee germplasm improvement in Malawi he joined the Institute of Grassland and Environmental Research (IGER), Aberystwyth, UK. in 1993. For a number of years he carried out research and breeding in forage legumes and became Head of the Plant Genetics and Breeding Department at IGER. Following merger with Aberystwyth University in 2008 [creating the Institute of Biological, Environmental and Rural Sciences (IBERS)] he became Professor of Public Good Plant Breeding and Director of International Development.